Introduction: Proficiency-based training for laparoscopic suturing has been shown to translate to improved performance in the OR. However, testing to maintain proficiency in resident training programs has not been established. The purpose of this study is to determine the efficacy of a maintenance testing curriculum for resident skill retention. 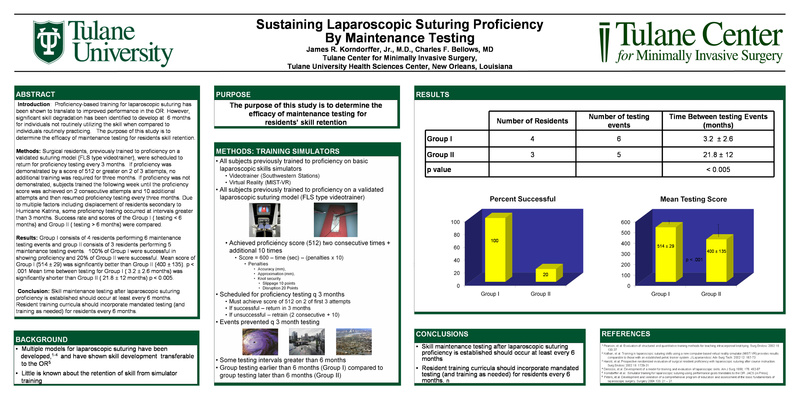 Methods: Surgical residents, previously trained to proficiency on a validated suturing model (FLS type videotrainer), were scheduled to return for proficiency testing every 3 months. If proficiency was demonstrated by a score of 512 or greater on 2 of 3 attempts, no additional training was required for three months. If proficiency was not demonstrated, subjects trained the following week until the proficiency score was achieved on 2 consecutive attempts and 10 additional attempts and then resumed proficiency testing every three months. Due to multiple factors including displacement of residents secondary to Hurricane Katrina, some proficiency testing occurred at intervals greater than 3 months. Success rate and scores of the Group I (testing < 6 months) and Group II (testing > 6 months) were compared. Results: Group I consists of 4 residents performing 6 maintenance testing events and group II consists of 3 residents performing 5 maintenance testing events. 100% of Group I were successful in showing proficiency and 20% of Group II were successful. Mean score of Group I (514 ± 29) was significantly better than Group II (400 ± 135). p < .001 Mean time between testing for Group I ( 3.2 ± 2.6 months) was significantly shorter than Group II ( 21.8 ± 12 months) p < 0.005. Conclusion: Skill maintenance testing, after laparoscopic suturing proficiency is obtained, should occur at least every 6 months. Resident training curricula should incorporate mandated testing (and training as needed) for residents every 6 months.